My First Scooter is a terrific pre-school 3 in 1 trainer scooter, specifically designed with the younger child in mind. 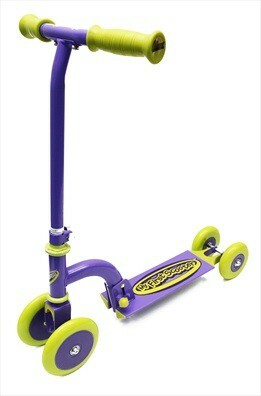 This excellent scooter is a wonderful way to encourage learning through active play. This clever and sturdy little My First Scooter grows with the child. The large 4 wheels provide extra support for the little ones as they learn to develops coordination and balance. As the little ones become a bit more confident the My First Scooter can be changed easily to become a 3 wheel scooter and then onto 2 wheels when the child is ready. It's so easy and comes with a small tool kit and detailed easy to follow instructions. 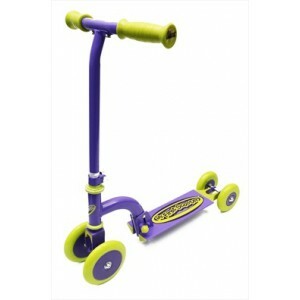 The My First Scooter can be folded down when not in use and has been designed in bright colours with co-ordinating soft grab hand grips. The My First Scooter is recommended for children aged 2 years+ and comes with an Ozbozz spare parts warranty.